The First Street Rapids Park is beautiful. Caramel-colored cliffs slope into the Deschutes River. This is surely postcard worthy. And, the addition last summer of a bridge to connect running paths on one side of the river to the other, surely made the space even more easily accessible. Yet, not everyone can access the park. There are still stretches of the pathway that require careful navigation across gravelly stretches and boulders—certainly too tricky for even the most burly wheelchair. 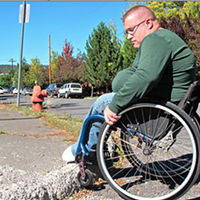 And that's why the Bend Park & Recreation District's planned for paths that meet with requirements set up by the Americans with Disabilities Act. "There's a principle, from the park's perspective, that parks are for people—and they're for all people," said Bend Park & Recreation district landscape architect Chelsea Schneider in a meeting room at the district's offices along SW Columbia St. recently. "That's one of our design tenets." Bordering a path on the Revere Ave. side of the park, a stretch of the Bend Riverside Motel fronts the water, as large homes look down on the opposite bank. The trail is a well-used feature of the district's parkland, attracting people from the area, as well as those vacationing and staying in those waterfront rooms. And that's part of the reason Schneider's helped to develop plans for more accessible pathways, better connecting each side of the river and the Deschutes River Trail as a whole. "We had two master plans that we presented (to the Park & Recreation District board)—they directed us to take the best of both," Schneider said. "Listening to the feedback we had from the neighborhood, they really wanted a less-is-more approach—a very hands-off approach. What we took away from that is that the trails should not be hard surfaced and as much as possible stay within the confinements of existing paths." Leaving a touch of its rustic feel is an inviting aesthetic for some and a foreboding obstacle for others. On the other hand, too much development, and the public space could become nothing more than a cross section of paved paths. Pending land use approval from the city, Schneider said the Park District will add a hard-surfaced path to the area, the only such stretch in the park, a winding ADA connection along the Revere Ave. side of the park. Schneider said construction could begin in the fall.